Have you enjoyed the warmth, softness and comfort of alpaca yet? You don't know what you are missing! Alpaca wicks moisture away from your body and is hypoallergenic. This shop carries a large variety of socks, hats, gloves, mittens, scarves, sweaters, yarn, nesting ornaments and much, much more. They also offer starter spinning and weaving classes with the option to purchase a spinning wheel or loom. Of course, you can see the alpacas as well, and learn about the fastest growing agri-business. Looking to start up an alpaca farm? 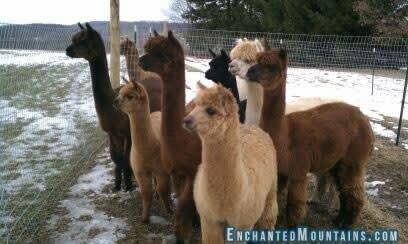 They have alpacas for sale and males for breeding. They would be more than happy to get you started. The farm, "A Slice of Heaven Alpacas" and their gift shop "Simply Natural Alpaca Gift Shop" are located in the heart of Amish Country just below the Hilltop Toy Shop. Open Monday and Tuesday 5pm-7pm, Wednesday through Friday 11am-7pm, and Saturday 9am-5pm. Don't forget your camera.